The idea of plein air painting and drawing… all right, plein air anything has fascinated me for a long time. I have seen (and envied) painters who just go out and face the elements, take in the real experience and put that immediate impression on canvas. However, what has puzzled me is the how. Not so much the technique, but rather the logistics of it all. 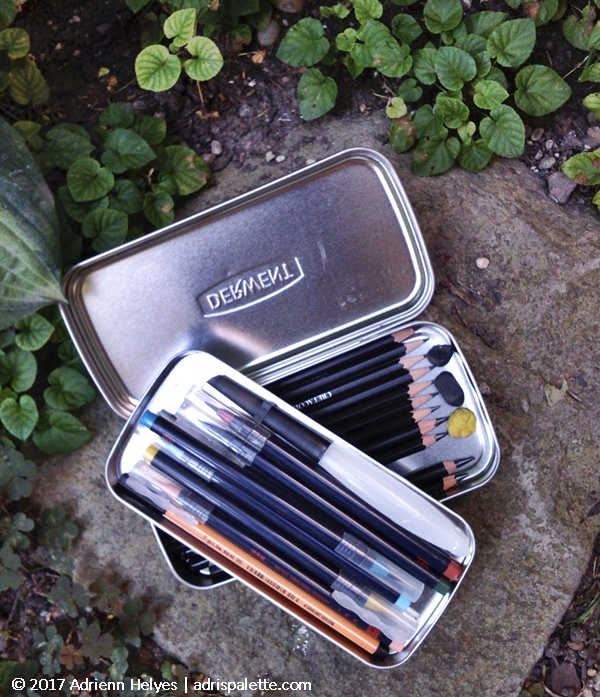 What has always puzzled me is how these artists take all their things with them on that plein air excursion. Then I read a post on Will Kemp’s webpage about his minimalist approach to this same subject and suddenly I had an aha moment. I realized I don’t have to carry my entire collection but might as well put together a little curated collection of items that would serve my purpose on that specific trip. A pen, a couple of pencils one day. A watercolor brush pen the next. Easy to put together and easy to carry, right? On our recent trip to Porto I decided to put this very idea to the test. 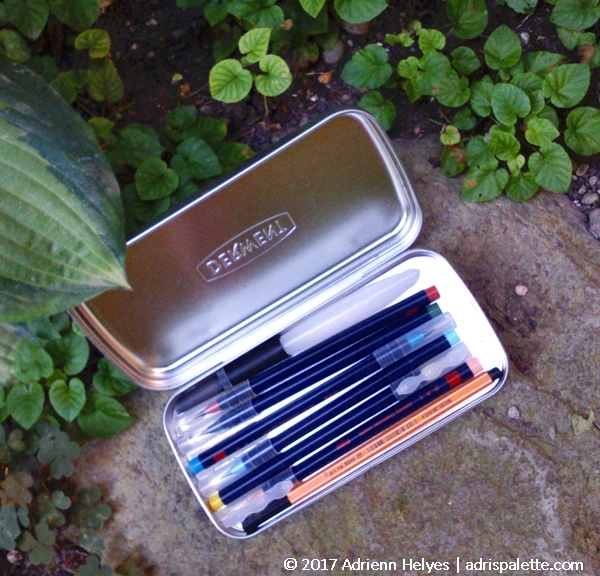 I put together my little minimalist plein air kit and… well, let me tell you about my experience. Minimalism is in the eye of the beholder. Just as minimalist interior design and wardrobe will work for some, it will not work for others. I realized I NEED more than one pencil with me. What if the lead breaks? What if the shade of yellow ocher brush pen I’m taking with me is not the right shade? What if my pen runs out of ink? See where I’m going? So when 5 is perfect for some, 20 might not be enough for me. OK, this seems obvious. However, let’s put the pouring rain factor aside for a moment. When you go outside on a cool spring morning all you’re taking with you is your kit, right? 200 – 300gs tops. In scorching summer weather you’re taking (minimum) 2 liters of water, an extra tube of sunscreen, your SPF lippy besides your pack. So we are nearing ten-fifteen times as much as the previous season. And I have not even considered possible lightweight (cough) chairs if you are not one to stand motionless on your two feet for an hour or so. You might be saying, Adri, don’t be such a wimp! However, think about the legwork you have to put in to get to the spot (and back…) with the before mentioned weight on your back. If you are one that is easily distracted, and need your peace and quiet to thrive, then I’m afraid the great outdoors is just not for you. First you’ll see the beauty of the open landscape. The endless rooftops and colorful buildings. And then everything else: the buzzing flies, the tourists who just keep coming and butting into your view every 2 minutes. And then the cute little kid with the ice cream. And don’t get me started on the cute dogs! While on vacation, you are on vacation. When the purpose of the trip is for the family to relax and enjoy themselves, and have a long and proper and well deserved we-time, then all thoughts about me drift away. Mr.AP and I have worked our pretty little behinds off this past year. So when the crazy hours, long Excel charts (although I love me some complicated little brain puzzle) and the endless tsunami of emails was far-far away, the only thing that occurred to me was that we are finally together! Was it the last day that Mr.AP asked me if I’d bring the drawing kit with me for the day’s trip? Oops! So all in all I think plein air drawing is like a Chanel bag for me: it sort of looks nice, but it is definitely not my cup of tea. Once the idea materialized itself and I had THE perfect little curated set in my paws (or my backpack) I realized it just does not fit into my style of vacationing: I need light-weight backpack and freedom of movement to walk long (and I mean long) distances, climb onto statues, run around the museum and try every single button and crank and what-have-you. To climb a rock on the edge of the cliff (sorry Mr.AP!). After our trip we went for a stroll to our city center. When I saw one of the regular painters happily painting away in plein air style I had this pang of conscience. I should have tried harder! And then I saw that he had a dried palette, a clean brush and no solvents with him. He wast faking it for the tourists! So I thought, you know what? This is me: I live the moment, and take from it my colorful memories and those moments that make me smile and draw from there. And not fake it.